If you want a quiet place to relax and enjoy nature and the country at its best, the Country Getaway is the place. Enjoy a private trail along the bank of the Englishman River. 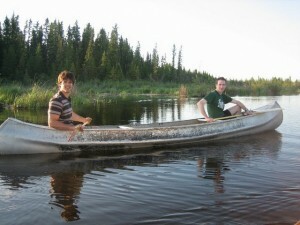 Go canoeing and fishing on the Englishman River – a canoe, paddles, and life jackets are available for your use. Watch the birds, beavers, otters, ducks, Canada geese and deer from the banks of the river. The Englishman River and adjacent marshes are home to a large number of birds. The guest house is located in a major flyway for many migrating birds and waterfowl. Whooping cranes have been observed landing in a field within ½ mile of the guest house! 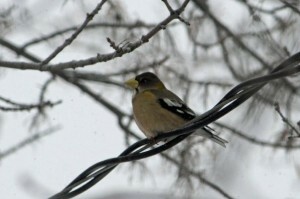 Dense spruce bluff and large tamarack and jack pine forest, within walking distance (½ to 1½ miles) from the guest house, provide an ideal home for many birds. 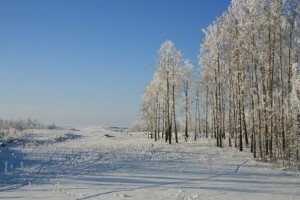 Go cross country skiing or ski-dooing on the trail along the bank of the river or across the open fields on our farm. See our Christmas/New Year packages for that special holiday in the country! Go fishing, boating, water skiing or swimming at any one of several lakes. There are 12 lakes within a 20-35 minute drive of the Guest House! Go golfing at any one of several excellent golf courses. There are 6 golf courses located within a 5-30 minute drive of the Guest House. The Getaway is situated on one of the best hunting areas in North America. Outstanding big game hunting – deer, moose, elk and bear. Our 5000 acre farm, consisting of large open grain and hay fields, riverbank and dense forests has outstanding deer hunting. Many record book bucks taken. The world record Whitetail deer was taken in west central Saskatchewan! We are situated on a major migratory bird flyway – excellent goose and duck hunting. We can assist you with the details of your hunt. Guests of the Getaway have access to hunt on all our farmlands. 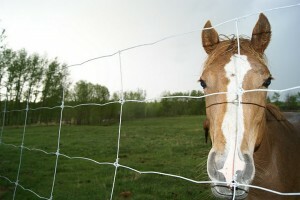 Bring your horse and enjoy nature at it’s best on horseback riding among the cows on the many acres of pastureland. Your horses will be kept in a small pasture right next to the Guest House where green grass and water are plentiful for your horse to enjoy. Cost: $20 per horse in addition to applicable room rate. Treat yourself and someone special to a stay at the Country Getaway on a special occasion. Romantic Packages, Christmas Packages, and special relaxation packages are specially designed for these occasions. Enjoy the privacy of having the whole house to yourself for these special intimate occasions. Dining only, for up to 8 people, is available with prior arrangements. If you want to enjoy dinner with special friends in a private country setting contact the Guest House for information and reservations. Price is dependent on meal selection. Enjoy a prairie sunset and watch the stars light up the sky.